WASHINGTON — NASA and the European Space Agency have selected 10 proposals for science instruments to fly aboard a spacecraft that will study the sun from a unique vantage point in space. The European-led mission, called the Solar Orbiter, will be positioned about one-fourth the distance Earth is from the sun. The location ultimately will enhance the ability for scientists worldwide to forecast space weather. Space weather can produce electromagnetic fields on Earth that induce extreme currents in wires, disrupting power lines, causing wide-spread blackouts and affecting communication cables that support the Internet. Severe space weather also produces energetic solar particles and the dislocation of Earth’s radiation belts, which can damage satellites used for commercial communications, global positioning and weather forecasting. Additionally, space weather poses risks to astronauts. 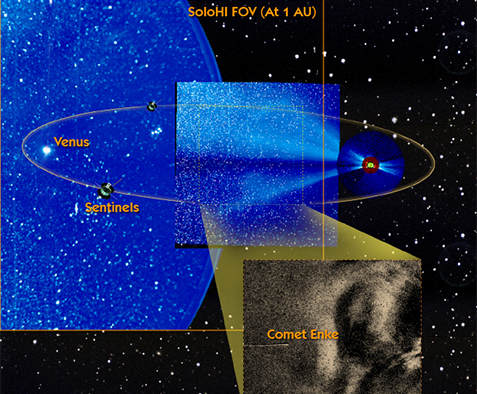 Of the 10 selected instrument proposals, three will receive NASA funding, including the Solar Orbiter Heliospheric Imager (SoloHI). This instrument will provide revolutionary measurements to pinpoint coronal mass ejections or CMEs. CME’s are violent eruptions with masses greater than a few billion tons. They travel from 60 to more than 2,000 miles per second. They have been compared to hurricanes because of the widespread disruption of communications and power systems they can cause when directed at Earth. Space Systems Research Corporation (SSRC) led the proposal development for SoloHI for the U.S. Naval Research Laboratory, Solar Physics Branch. SSRC led the coordination of government scientists and contractors in the development of the SoloHI concept to address the research objectives outlined by NASA. SSRC provided proposal management & compliance, life-cycle cost estimates, project management systems, and System Safety Reliability & Mission Assurance (SSR&MA).